The middle Eocene Tyee Formation, a thick repetitious sequence of rhythmic-bedded units of graded sandstone and siltstone, has a wide areal distribution in the southern and central parts of the Coast Range of Oregon. The formation consists principally of arkosic, lithic and feldspathic wacke with lesser amounts of volcanic wacke. Petrographic studies and new chemical analyses indicate that the sandstone is rather uniform in composition throughout the outcrop area. X-ray diffraction studies of the silt and clay, which constitute about 30 percent of the wackes, show that montmorillonite and mixed-layer montmorillonite predominate. The soles of individual graded units are sharply defined and usually contain the casts of sedimentary structures. Groove casts and flute casts are the most common types. Analysis of more than 500 directional readings made on these sedimentary structures indicates that the detritus that comprises the Tyee Formation was transported northward in an early Tertiary geosyncline. The source area for the Tyee sediments is believed to be a metamorphic, igneous, and sedimentary terrane in the area of the ancestral Klamath Mountains that lay south of the geosyncline. Active andesitic volcanism immediately east of the geosyncline also contributed pyroclastic and epiclastic debris to the streams that drained into the basin of deposition. It is speculated that streams draining these two principal source areas constructed large deltas where they reached the coast along the southern part of the geosyncline. Periodic slumping at steep delta fronts moved large masses of water-saturated deltaic material basinward. These mass movements are believed to have been transformed into turbidity currents that transported the debris northward along the axial parts of the trough for a distance of more tban 150 miles. These turbidity currents would have been deflected around volcanic highs that existed in places near the axis of the trough. Near the close of middle Eocene time the geosyncline was nearly filled with turbidity current deposits to a thickness of approximately 10,000 feet along the axis of the trough. The Klamath source area was eroded to a region of moderate relief and furnished only minor amounts of clastic debris to the marine environment. Silt and clay became the dominant lithology deposited in the geosyncline. The middle Eocene Tyee Formation of the Oregon Coast Range consists of many hundreds of thick rhythmic-bedded units (Fig. 1) in which the sole markings show a preferred orientation. This repetitious sequence of graded sandstone and siltstone is interpreted as sediments laid down by turbidity currents that flowed northward along the axis of a eugeosyncline that occupied the present site of the Oregon Coast Range. The sedimentology of the Tyee is being investigated as a topical phase of a program of detailed regional mapping in the west-central part of the Coast Range, and although much work remains to be done before many of the details of the depositional history of the formation are fully understood, reconnaissance studies have shed new light on this history. The information presented here also is intended to call to the attention of others concerned with cyclic sedimentation a few of the interesting problems available for study in the flyschlike rocks of the Tyee Formation that crop out over much of the southern half of the Oregon Coast Range (Fig. 2). The writers wish to acknowledge assistance in the field by F. A. Schilling, Jr., A. M. Johnson, and C. H. Nelson in the summers of 1960, 1961, and 1962, respectively. Patsy Still aided in the compilation of data and preparation of illustrations. The manuscript was improved by the constructive criticism of Dallas L. Peck and David L. Durham. Figure 1--Tyee Formation showing graded units that range from medium-grained arkosic wacke in lower part to siltstone in upper part. Exposed along Siletz River about 9 miles north of Siletz, Oregon. The Tyee Formation was first described by Diller in 1898 from exposures at Tyee Mountain in the southeastern part of the Oregon Coast Range (Fig. 2). Regional geologic mapping, principally by Baldwin, Snavely, and Vokes (Baldwin, 1947, 1955, 1956, 1961; Vokes and others, 1949, 1951, 1954; Snavely and Vokes, 1949) extended the use of the formational name throughout the southern and central parts of the Oregon Coast Range, and established the continuity of the Tyee Formation northward to include a correlative sandstone sequence designated the Burpee Formation by Schenck (1927) from outcrops east of Newport (Fig. 2). Strata previously assigned to the Burpee Formation are herein relegated to the Tyee Formation and the name Burpee Formation is abandoned. Figure 2--Index map of western Oregon showing area of outcrop of Tyee Formation and its relation to major geomorphic provinces. A larger version of this figure is available. In the southern part of the Oregon Coast Range the Tyee Formation overlies the Umpqua Formation (Diller, 1898), a sequence of lower to middle Eocene marine siltstone and graywacke beds and associated submarine volcanic rocks. In the central part of the range the Tyee overlies volcanic rocks and tuffaceous marine sedimentary rocks of the lower to middle Eocene Siletz River Volcanic Series (Snavely and Baldwin, 1948). Baldwin (1963) suggests that in the southern part of the Coast Range a regional angular unconformity is present between the Tyee Formation and the Umpqua Formation. In the central part of the range, however, unconformities between the Tyee Formation and the Siletz River Volcanic Series are of local extent. The writers believe that these local unconformities occur in areas where Tyee beds lap onto topographic highs formed by thick accumulations of submarine volcanic rocks. The lack of distinctive stratigraphic horizon markers within the repetitious Tyee Formation precludes detailed analysis of the structure and makes accurate thickness measurement difficult. The thickness of the Tyee, however, is estimated as more than 6,000 feet, and perhaps as much as 10,000 feet where it is thickest along the axis of the basin of deposition. The upper part of the Tyee is missing in many areas where a major regional unconformity occurs at the base of the overlying uppermost Eocene strata. Where the upper part of the Tyee is exposed, the sandstone of the Tyee is interbedded with fossiliferous dark-gray mudstone and siltstone of latest middle Eocene age. This transition zone between the arenaceous rocks, typical of the Tyee Formation, and the overlying argillaceous strata is several hundreds of feet thick at some localities. These transitional beds were named the Elkton Siltstone Member of the Tyee Formation by Baldwin (1961). In the area generally north of latitude 45°, the Tyee Formation interfingers northward with well-indurated dark-gray tuffaceous siltstones that in places contain interbeds of water-laid pyroclastic material. These siltstones include strata referred to as middle? Eocene shale by Warren and others (1945) in the Yamhill quadrangle, and part of the sequence mapped as undifferentiated volcanic and sedimentary rocks by Baldwin and Roberts (1952) in the Spirit Mountain quadrangle. In the central part of the Coast Range, the Tyee Formation probably also grades laterally into finer grained clastics both east and west of its outcrop area, but these facies relations are concealed on the eastern margin of the basin of deposition by volcanic rocks of the Cascade Range and on the western margin by the Pacific Ocean. Fossils are rare in the Tyee Formation and are found only in the uppermost part. Despite its great thickness, the Tyee represents little time, for it is underlain and overlain by marine strata of middle Eocene age. The underlying siltstone strata in the upper part of the Umpqua Formation contain a foraminiferal fauna correlative with Laiming's (1940) B-1 zone and Mallory's (1959) Ulatisian Stage of the middle Eocene of California (W. W. Rau, written communication, 1963). The overlying mudstone strata near the town of Siletz contain in the lower part a foraminiferal assemblage correlative with faunas found in Laiming's B-1 and B-1A zones and Mallory's upper Ulatisian (middle Eocene) or lower Narizian (late middle Eocene) Stages (W. W. Rau, written communication, 1963). Within the Tyee Formation, a foraminiferal fauna, in a siltstone interbed about 300 feet stratigraphically below its upper contact near the town of Siletz, contains forms indicative of the middle Eocene B-1 zone of Laiming and the Ulatisian Stage of Mallory (W. W. Rau, written communication, 1963). Molluscan faunas collected from the Elkton Siltstone Member in the uppermost part of the Tyee Formation indicate a correlation with the middle Eocene Domengine Stage of the standard West Coast Eocene (Weaver and others, 1944). The Tyee Formation exhibits many features that are commonly interpreted as characteristic of sediments deposited by turbidity currents (Kuenen, 1951, 1953; Kuenen and Carozzi, 1953; Crowell, 1955; Dzulynski and others, 1959; Allen, 1960; Bouma, 1962; and others). These include: rhythmic-bedded units of graded sandstone and siltstone, lateral continuity of these units, poor sorting of individual graded beds, sharp soles containing directional features with preferred orientations (such as groove casts and flute casts), tabular siltstone clasts with pull-aparts, slump structures and convolute bedding, uniformity in lithologic composition, and general lack of marine fossils. The Tyee Formation consists of graded units (rhythmites of Sander, 1951, p. 135) that commonly range in thickness from 2 to 10 feet and average 3 to 5 feet (Fig. 3). In the southern part of the outcrop area, where individual graded units are generally thickest, beds of massive sandstone 10 to 20 feet thick are common. North of the latitude of Newport the graded units are thinner, and the sequence contains a higher percentage of siltstone. The graded units consist of sandstone in the lower part and grade upward into siltstone and mudstone. The sandstone is generally medium greenish gray and bluish gray, and fine to medium grained; the siltstone and mudstone are dark greenish gray and carbonaceous. The predominantly silty upper part of the units, although missing in places, usually represents less than one-quarter of the total thickness, and the boundary between the siltstone and sandstone is abrupt (Fig. 4). The sandstone of the graded units is more resistant to erosion than the siltstone so that in most exposures the sandstone stands in relief and gives the outcrop a banded appearance (Fig. 1). The rhythmites persist along the strike, and a single bed can be traced for the entire length of its outcrop (as much as one-quarter of a mile) with no apparent thinning. Figure 3--Typical graded units measured in Tyee Formation, near Pioneer Summit, about 10 miles east of Newport, Oregon. Figure 4--Graded units (rhythmites) in Tyee Formation, along the Siletz River about 9 miles north of Siletz, Oregon. Rather abrupt transition from sand-size to silt-size material takes place near middle of hammer handle. Hammer rests on 8-inch calcareous concretion. Granule and pebble-size materials are uncommon in the Tyee Formation, but in places In the southern part of the outcrop area rudely imbricated elongate pebbles, chiefly of andesite, occur in some thick sandstone units. In the northern part of the outcrop area, however, no relation is apparent between bed thickness and maximum grain size. 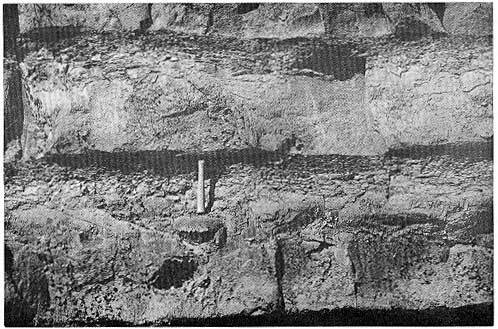 Hoover (1963, p. 24) also observed the lack of relationship between bed thickness and grain size in the east-central part of the Tyee outcrop area. In the southermnost part of the outcrop area, lenticular conglomerate and conglomeratic mudstone are interbedded with the thick sandstone units of the Tyee. The lower part of individual graded units consists of massive-appearing sandstone in which the grading generally is indistinct. Sedimentary structures rarely occur within this part of the units, but poorly developed, small-scale cross-stratification is present in a few places. Brown-weathering calcareous concretions, as much as 1 foot in diameter, and calcite cemented sandstone beds occur locally. Intraformational breccia, containing tabular clasts of siltstone as long as 1 foot, commonly occurs within the sandstone portion of the rhythmite. The clasts are imbricated in a few places and many have pullapart structures with serrated, unabraded ends. In places large strips of siltstone have been deformed into overfolds similar to those figured by Crowell (1957, p. 1000) and into irregular-shaped bodies. In a few outcrops siltstone clasts constitute as much as 25 percent of the sandstone portion of the rhythmite. The upper part of each rhythmic unit is generally dark greenish-gray tuffaceous, micaceous siltstone and less abundant mudstone. Fragments of reedy plants are common in the very fine grained sandstone and siltstone portions of the graded units, and carbonaceous material along bedding planes commonly imparts an indistinct parallel lamination. In places carbonaceous material is concentrated in sufficient quantity to form impure coal. Commonly, rectangular carbonaceous fragments have a preferred orientation. In most exposures the siltstone portion of the rhythmite is indistinctly graded and appears structureless on the outcrop, but in several places the uppermost part of the graded units contains thin-bedded to laminated very fine grained sandstone and siltstone that show fine cross laminations, parallel laminations, and current ripple laminations (Fig. 5). Sufficiently detailed studies have not yet been made in these more easily weathered upper parts of the rhythmites to determine the frequency of such features, or to determine whether the Tyee rhythmites have a distinctive sequence of sedimentary structures similar to those described by Bouma (1962, p. 48-66) from the Peira-Cava area of southern France. The siltstone portion of many graded units is absent, due either to nondeposition or to erosion by the turbidity current that transported the material in the overlying bed. The common occurrence of rectangular siltstone clasts within the rhythmites suggests that these fragments were ripped from the top of the underlying rhythmite by the turbidity current. In a few places, thin-bedded to laminated siltstone units, as much as 8 feet thick, occur between the rhythmites. Figure 6--Ternary diagram showing relative proportions of mineral and lithic grains in arenaceous rocks of Tyee Formation (classification after Williams and others, 1954, p. 292). 1. Lithic wacke, center, SW sec. 32, T. 20 S., R. 10 W., Goodwin Peak quad, Oregon. 2. Arkosic wacke, NW NW sec. 14, T. 12 S., R. 10 W., Toleda quad, Oregon. 3. Lithic wacke, center, sec. 1, T. 22 S., R. 11 W., Scottsburg quad, Oregon. 4. Siltstone, NE NW sec 18, T. 14 S., R. 9 W., Tidewater quad, Oregon. Thin section studies of 75 sandstone samples show that the Tyee is composed primarily of quartz, unstable lithic fragments, and feldspar, with lesser amounts of mica, chert, and pelitic fragments. Most of the mineral grains are subangular or subrounded and have an average size of about 0.2 mm (Fig. 7); the largest grains are about 1 mm. Quartz, which commonly has undulatory extinction, is the dominant detrital mineral in the sandstone and composes 20 to 40 percent of the grains (average 30 percent). The roundness of quartz grains averages about 0.3; the sphericity averages about 0.7. (Note: Roundness and sphericity based on visual comparison with the chart of Krumbein and Sloss (1951, p. 81).) Plagioclase ranges from euhedral crystals to rounded grains and makes up 3 to 20 percent of the rock (average about 10 percent). Composition of the plagioclase is most commonly andesine or calcic andesine, but ranges from oligoclase to labradorite. Many of the plagioclase grains are euhedral, a shape that is interpreted as evidence of their volcanic origin, probably from feldspathic tuffs. In support of this interpretation, the detrital grains of plagioclase and the plagioclase laths in volcanic lithic fragments are similar in composition, and show a very common and pronounced oscillatory zoning. Also, the sandstones that contain larger proportions of volcanic fragments generally have a greater proportion of plagioclase. Figure 7--Photomicrograph of sandstone from Tyee Formation. Ordinary light. B--biotite, F--feldspar, M--metamorphic fragment, Pe--pelitic fragment, Q--quartz, V--volcanic fragment, W--white mica. K-feldspar is less common in the sandstone than is plagioclase and generally makes up less than 5 percent of the grains in the thin sections studied. In order of abundance the K-feldspar minerals were identified as orthoclase, sanidine, perthite, and microcline. Because small grains of K-feldspar are difficult to distinguish from quartz, staining techniques using sodium cobaltinitrite (Bailey and Stevens, 1960) were used to determine the quantitative error in the identification of these minerals in unstained thin sections. Modal analyses of several stained rock slabs and thin sections indicate that K-feldspar constitutes a higher percentage of the sandstone grains than is apparent when working with unstained thin sections. The plots of sandstone composition on Figure 6 are based on modal analyses of unstained sections, and presumably most of the individual points would shift slightly towards the feldspar corner of the triangular diagram if stained sections had been analyzed. The most characteristic feature of Tyee sandstone, both in hand samples and thin sections, is the abundance of large crinkled flakes of muscovite and smaller flakes of biotite. The micas compose 1 to 15 percent of the grains, and average about 5 percent. Muscovite generally predominates over biotite, but the reverse order of abundance is common. The micas are as much as 2 mm in largest dimension and generally are molded around other grains. The muscovite in most thin sections is unaltered, whereas biotite ranges from fresh to completely altered. Volcanic fragments, which are the most common lithic grains in Tyee sandstone, constitute about 10 percent (range: 1 to 25 percent) of the clastic material. The texture and composition of the fragments vary somewhat, but vitrophyric or pilotaxitic andesite and, less commonly, basalt predominate. The glassy groundmass is almost invariably devitrified, and in many places grain boundaries are obscure where the grains are surrounded by clay matrix. Plagioclase, the only primary mineral in many of the grains, displays pronounced oscillatory zoning and twinning. Very small pyroxene crystals and opaque minerals are commonly scattered through the devitrified groundmass. Silicic volcanic rock fragments are rare, but were observed in several thin sections. Metamorphic rock fragments, which average about 2 percent, but form as much as 8 percent, of the clastic material are predominantly quartz-muscovite schist or quartz-biotite schist. Quartz-epidote hornfels and hypersthene-plagioclase-quartz hornfels also were identified in thin sections. The small size of most of the lithic fragments and the pervasive alteration of the rock make difficult the identification of the rock type in these fragments. Fragments composed of interlocking quartz grains (quartzite? ), which may be either of plutonic or metamorphic origin, and of crypto-crystalline chert make up about 6 percent (range: 2 to 30 percent) of the grains. Fragments of pelitic rock form approximately 1 percent of the grains, and fragments of carbonaceous material are locally abundant. In many specimens calcite cement makes up as much as 20 percent of the rock. The calcite is rather dark in thin section, due to included clay minerals, but is easily distinguished, and was noted in quantities greater than 1 percent in approximately one-quarter of the sections studied. Opaque minerals (magnetite and ilmenite) make up 2 percent or less of the grains. Hornblende, garnet, tourmaline, zircon, zoisite, rutile, allanite, sphene, and monazite were identified; of these only hornblende is present in more than trace amounts. The wackes of the Tyee Formation have a matrix of silt and clay that compose about 30 percent (range: 10 to 50 percent) of the rock. As shown in the grain size percentage diagrams (Fig. 8), the proportions of clay and silt generally increase upward in the rythmites with an abrupt increase near the top of the sand fraction. The diagrams of four graded units, designated A to D from north to south (see, Fig. 2), indicate a general decrease in sand and increase in silt northward. In all except the southermnost unit, D, a relative increase in the silt and clay fraction occurs 6 to 12 inches above the base of the rhythmite. X-ray diffraction studies of the clay indicate that montmorillonite and mixed layer montmorillonite-mica together with illite predominate; kaolinite is present in lesser amounts. (Note: X-ray diffraction using nickel-filtered copper radiation and techniques similar to those described by Hataway (1956).) In a few samples the upper few inches of individual rhythmites are predominantly illite and kaolinite, with montmorillonite either present in small amounts or absent. A preliminary study of the clay mineralogy of the unnamed mudstone unit that overlies the Tyee near the town of Siletz and of the siltstone interbeds in the upper part of the underlying Umpqua Formation indicates that illite and kaolinite are the predominant clay minerals. Cummings and Beattie (1963, p. 29) suggest that the change in clay mineralogy in the upper part of graded units is principally the result of authigenic enrichment of the sediments in iIlitic clays, but because a considerable amount of pelagic clay of illitic and kaolinitic composition was deposited both before and after Tyee time, pelagic sediments can reasonably be assumed to have been accumulating in the geosyncline during deposition of the Tyee as well. These pelagic clays would form recognizable beds only if considerable time elapsed between deposition of individual rhythmites. Figure 8--Grain size percentage diagrams of four typical rhythmites in Tyee Formation. Samples analyzed were taken at 6-inch intervals. Pipette and sieve analyses made by James A. Thomas, U.S. Geological Survey. The soles of graded units are sharply defined, and although commonly they contain casts of several kinds of sedimentary structures, some are smooth and planar. Groove casts are by far the most common sole markings and occur in more than one-half of the exposures examined. These groove casts range in size from delicate ridges 1/8-incb across to inverted tunnel shaped features with breadths as much as 8 inches and amplitudes of 6 inches. Most groove casts, however, are 2 to 4 inches in breadth and 1/2 to 2 inches in amplitude (Fig. 9). They are often uniformly spaced and in cross section have the appearance of oscillation ripple marks, for which they have been mistaken. Grooves exposed in a quarry along the Umpqua River in the southwestern part of the outcrop area probably were formed by the gouging action of plant debris that was swept across the muds on the sea floor. The moving debris also produced small drag folds that curve toward the direction that the material was transported (Fig. 10). The low dip of the strata coupled with poor exposures precludes large exposures of bedding planes. Therefore, the extent of most groove casts cannot be measured. On quarry slabs they extend completely across the block (as much as 10 feet), but many are undoubtedly tens of feet long. The groove casts commonly contain longitudinal ridges or striae, and in a few places pea-sized nodes occur along the crests of the groove casts. Where both groove casts and striations have been observed together on the sole of a graded unit, the two features usually diverge less than 20 degrees. Figure 9--Deformed groove casts at base of graded sandstone unit in Tyee Formation viewed perpendicular to north-south direction of lineation. Flame casts (F) formed at sandstone-siltstone interface by penecontemporaneous slumping westward from left to right. Photograph taken at Green Mountain about 5 miles south of Valsetz, Oregon. 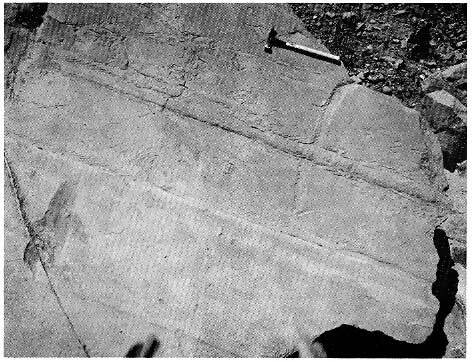 Figure 10--Groove casts on base of graded unit in Tyee Formation. Small drag features along groove casts indicate that current moved from right to left. Small rectangular casts in upper part of photograph are impressions of plant fragments. Photograph taken in quarry on south side of Umpqua River about 7 miles east of Reedsport, Oregon. Flute casts occur in many outcrops of the Tyee Formation, either as isolated structures or in clusters. Such casts are oblong-shaped, are as much as 6 inches long, have bulbous ends up current (to the south in the mapped area), and tail out down current. The flute casts generally trend parallel to the groove casts, but in some outcrops the trends of the two form an acute angle. Many flute casts have a ropy appearance caused by shallow ridges and striations parallel to their length. Overlapping flute casts appear to be superimposed on groove casts in places (Fig. 11). 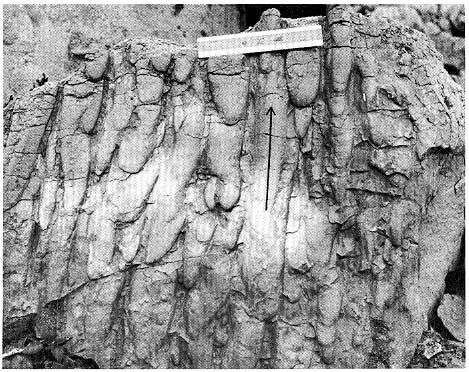 Figure 11--Flute casts, probably superimposed on groove casts, in Tyee Formation. Arrow indicates direction of current. Photograph taken at Green Mountain about 5 miles south of Valsetz, Oregon. Penecontemporaneous slump structures, although not common in the Tyee Formation, occur in thick (6 to 8 feet) siltstone units within the graded sequence. These dark-gray siltstone units contain light-gray, fine-grained sandstone interbeds 1 to 4 inches thick that clearly indicate details of structures produced by submarine gravity sliding. Detached sandstone beds in these units have heen deformed into recumbent folds, "jelly-roll" features, and complexly contorted masses. The folds average about 1 to 2 feet in height and width. The trend of fold axes and the direction of overturning in slump structures, measured in the upper part of the Tyee Formation at four widely separated places in the northern part of its outcrop area, indicate movement toward the west or west-northwest. This suggests that the deepest part of the basin of deposition in the central part of the Coast Range shifted westward with time and that downwarping of the basin produced gradients steep enough to promote slumping normal to its axis. 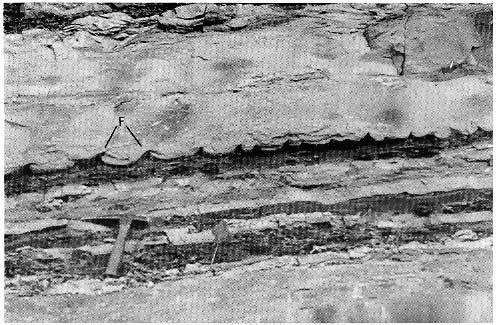 In one outcrop, structures similar to flame casts (Walton, 1956, p. 267-268) are streaked out into the overlying sandstone at right angles to the north-south lineation of the groove casts (Fig. 9). This streaking is directed westward, also indicating a deepening of the basin to the west soon after deposition of these sediments. About 500 directional measurements were made on current structures; these strongly indicate northward transport of material in the geosyncline (Fig. 12). (Note: In particularly good exposures, several current-direction readings were made, and an average of these readings was plotted.) Approximately 90 percent of the measurements were made on groove casts and indicate that the currents flowed either north or south. More than 60 measurements made on flute casts show that the currents moved northward. Figure 12--Trends of groove casts and flute casts in Tyee Formation, Oregon Coast Range. A larger version of this figure is available. A rose diagram of the groove casts (Fig. 13) shows a maximum trend directed N. 5 E. Two secondary trends diverge about 20 degrees east and west of this maximum. The rose diagram for the flute casts (Fig. 14) shows a maximum trend directed N. 10 W. with a secondary maximum trending N. 30 E. A third maximum trends N. 10 E. and coincides approximately with the maximum trend of the groove casts. Figure 13--Rose diagram of orientation of approximately 500 groove cast lineations in Tyee Formation, Oregon Coast Range. Bearings of lineations on inclined strata were corrected by rotation to horizontal and plotted to nearest 5 degrees. Figure 14--Rose diagram of orientation of approximately 60 flute casts in Tyee Formation, Oregon Coast Range. Bearings plotted to nearest 5 degrees. The grouping of groove cast lineations around a N. 5 E. direction and the northward current sense indicated by the flute casts are interpreted as reflecting the general northward movement of the turbidity currents responsible for the Tyee Formation, and hence a northward bottom slope of the basin of deposition. Northeast and northwest divergences in current direction readings, 15 to 25 degrees from the N. 5 E. trend, in part probably reflect changes in current flow in response to bottom relief in the basin. Volcanic highs were present in places in the eugeosyncline (Snavely and Wagner, 1963), and such highs probably diverted the turbidity currents away from their general northward flow. A volcanic high undoubtedly existed immediately south of latitude 45°, where interflow soil zones, locally derived mudflow breccias, and subaerial basalt flows in the exposed underlying Siletz River Volcanic Series indicate that these rocks accumulated in sufficient thickness to form an island within the geosyncline. The northeast and northwest divergences of current direction lineations south of this area (Fig. 12) suggest that turbidity currents were deflected around this area of volcanic accumulation. The presence of rhythmites of the Tyee Formation above the subaerial flows indicates that this volcanic island was eventually buried by the turbidite deposits. The generally higher content of basaltic fragments in sandstone of the Tyee Formation in this area supports the concept that the Siletz River Volcanic Series was subjected to subaerial erosion and supplied detritus to the basin. The limited number of readings on directional features obtained by the writers in the southernmost part of the outcrop area of the Tyee Formation (Fig. 12) precludes more than speculation as to the sources of sediments in the Tyee. Also, much of the Tyee that would be helpful in determining a specific source area has been removed by erosion. Available directional features suggest that the principal sources of Tyee sediments lay south of the present area of outcrop. The few northeast-trending groove casts in the southwestern part of the outcrop area and in places in a belt that extends diagonally northeast across the Coast Range between Coos Bay and Eugene (Fig. 12) are interpreted as caused by turbidity currents that flowed down the flanks of a northwest-trending pre-Tertiary highland that may have existed west of Coos Bay (Snavely and Wagner, 1963). Therefore, divergences of current direction readings in the southern part of the outcrop area may reflect the overlapping of turbidites originating in two source areas, one in the southern part and the other in the southwestern part of the geosyncline. As the preponderance of measurements on sedimentary structures is northward, the principal source area probably was to the south. The lithologic character of the Tyee Formation is consistent with the interpretation that the sediments were derived from the south, as much of the material consists of debris eroded from a metamorphic, igneous, and sedimentary terrane similar to that of the Klamath Mountains. 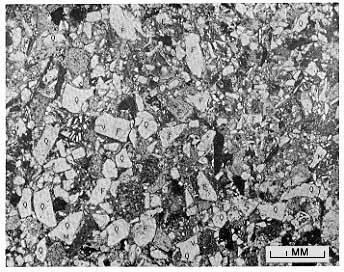 For example, grains of quartz-muscovite schist and abundant muscovite in the Tyee could have been derived from some of the metamorphic rocks of pre-Tertiary age that are assigned to the Abrams Mica Schist by Irwin (W. P. Irwin, oral communication, 1963), Grouse Ridge Formation by Davis and Lippman (1962), and Colebrooke Schist of Diller (1903). Much of the quartz, biotite, and K-feldspar could have been derived from fine- to coarse-grained granitoid rocks, such as the biotite granites, granodiorites, and trondjemite mapped in the Klamath Mountains by Wells (1955) and Davis (1963). Clasts of hornfels in the Tyee Formation could have been derived from rocks in the extensive contact aureoles around the granitic bodies (W. P. Irwin, oral communication, 1963; Davis, 1963). The heavy minerals in the Tyee Formation, including clinopyroxenes, epidote, tourmaline, zircon, hornblende, sphene, and garnet, are common in gneisses and schists that crop out throughout the Klamath province (Wells and Walker, 1953). Sedimentary rocks, mainly shelf-type deposits of Cretaceous age, formerly covered much of southwestern Oregon (Jones, 1960) and unquestionably contributed large quantities of detrital material to the Tyee basin of deposition. Peck and others (1956) report that quartz, feldspar, lithic fragments, and biotite are major constituents of the arkosic wackes in the Upper Cretaceous Hornbrook Formation. Therefore, similar clastic material in the Tyee Formation could have been reworked from Upper Cretaceous sedimentary rocks. Chert, which is present in most of the sandstone of the Tyee, is a common constituent in eugeosynclinal Mesozoic sedimentary rocks, such as those of the Applegate Group and the Dothan Formation (Wells and others, 1949, p. 3-8), that crop out in broad areas in the southeastern part of the Klamath Mountains. Clasts of andesite and euhedral grains of andesine feldspar are two principal components of Tyee sandstone and are believed to have been derived from contemporaneous volcanism immediately east of the geosyncline, as similar rocks are found in the Eocene volcanic terrane of eastern Oregon. The unstable nature of this andesitic volcanic debris demands rapid deposition and burial in order to preserve it in the Tyee. A part of the volcanic material in the Tyee Formation could have been derived from the andesite and dacite that are intercalated with Jurassic sedimentary rocks, particularly in the Galice Formation (Wells and others, 1949, p. 4-5) and Rogue Formation (Wells and Walker, 1953). Considerably more detailed petrography needs to be done on the volcanic components of the Tyee and on the products of lower Tertiary and Mesozoic volcanism before the provenance of the volcanic material in the Tyee can be more definitively evaluated. Certain broad interpretations of the depositional history of the Tyee Formation seemingly are warranted on the basis of the field and laboratory data herein presented, particularly where these data are evaluated within the regional geologic framework of western Washington and Oregon (Snavely and Wagner, 1963). At or near the end of Cretaceous time, downwarping along the Pacific margin produced a linear geosyncline that extended southward from Vancouver Island to the Klamath Mountains, a distance of about 400 miles. The eastern margin was beneath the present Cascade Range, and the western margin was west of the present coast line. Early in the history of the geosyncline, in the early Eocene, a thick sequence of tholeiitic basalt in the form of pillow lavas and breccia erupted from numerous centers onto the floor of the rapidly subsiding trough. These volcanic rocks intertongued with, and in places were buried by, silts and impure sands that probably were derived from the southern and eastern margins of the geosyncline. Very coarse clastic debris, including cobbles and boulders, was laid down contemporaneously with the sands and silts in the southern part of the geosyncline, reflecting uplift and erosion of a rugged pre-Tertiary terrane in the present Klamath Mountains area. The presence of tuffaceous material and detrital grains of andesite in many of the impure sandstone beds of the Umpqua Formation suggests that part of the detritus was derived from volcanic fields that lay east of the geosyncline. The current structures, the graded nature of many of the graywacke beds, and the high percentage of unstable rock fragments in the Umpqua indicate rapid deposition, probably by turbidity currents that flowed generally northward and westward into the deeper parts of the basin (Snavely and Wagner, 1963, p. 1-6). In middle Eocene time major uplift and erosion in the Klamath pre-Tertiary terrane south of the geosyncline and contemporaneous volcanic activity east of the geosyncline supplied great quantities of arkosic, lithic, and volcanic debris to the south end of the geosyncline where large deltas may have formed. Periodic slumping at the delta fronts, perhaps triggered by earthquake shocks that accompanied active volcanism east of the geosyncline or by the failure of water-saturated, metastable sediments under gravity load, moved large masses of this mixed sand, silt, and clay basinward. These mass movements of clastic materials northward into the deeper part of the geosyncline are believed to have been transformed into turbidity currents that flowed along the axial part of the trough at least as far north as latitude 45°. The materials thus transported and deposited now form the Tyee Formation. Northeast-trending current directions in a belt extending from Coos Bay to Eugene suggest that the source of some of the detritus was a highland area that may have existed west of the present coast line. Near the close of middle Eocene time, the geosyncline was nearly filled by turbidity-current deposits to a thickness of approximately 10,000 feet along the axis of the trough. The Klamath source area apparently had been eroded to a region of moderate relief and furnished less debris to the marine environment. At this time coal-bearing continental beds and nearshore bar-type sands were laid down near the southern fringe of the basin, and silt and clay, probably derived from a northeastern source, became the dominant lithology in the geosyncline. Allen, J. R. L., 1960, The Mam Tor Sandstones: a "turbidite" facies of the Namurian deltas of Derbyshire, England: Jour. Sed. Pet., v. 30, no. 2, p. 193-208. Bailey, E. H., and Stevens, R. E., 1960, Selective ataining of K-feldspar and plagioclase on rock slabs and thin sections: Am. Mineralogist, v. 45, nos. 9 and 10, p. 1020-1025. Baldwin, E. M., 1947, Geology of the Dallas and Valsetz quadrangles, Oregon: Oregon Dept. Geol and Min. Ind. Bull, 35, 61 p.
Baldwin, E. M., 1955, Geology of the Marys Peak and Alsea quadrangles, Oregon: U. S. Geol Survey Oil and Gas Inv. Map OM-162. Baldwin, E. M., 1956, Geologic map of the lower Siuslaw River area, Oregon: U. S. GeoL Survey Oil and Gas lnv. Map OM-186. Baldwin, E. M., 1961, Geologic map of the lower Umpqua River area, Oregon: U. S. Geol Survey Oil and Gas lnv. Map OM-204. Baldwin, E. M., 1963, Lower and middle Eocene formations of southwestern Oregon (abs. ): Geol Soc. America 59th Ann. Cordilleran Sec. Mtg. Program, p. 20-21. Baldwin, E. M., and Roberts, A. E., 1952, Geology of the Spirit Mountaiin quadrangle, Oregon: U. S. Geol Survey Oil and Gas. lnv. Map OM-129. Bouma, A. H., 1962, Sedimentology of some flysch deposits--a graphic approach to facies interpretation: Elsevier Publ Co., Amsterdam, The Netherlands, 168 p.
Crowell, J. C., 1955, Directional-current structures from the Prealpine Flysch, Switzerland: Geol. Soc. America Bull., v. 66, no. 11, p. 1351-1384. Crowell, J. C., 1957, Origin of pebbly mudstones: Geol Soc. America Bull, v. 68, no. 8, p. 993-1010. Cummings, J. C., and Beattie, J. A., 1963, Distribution of clay minerals in graded beds of Tyee Formation (Eocene), western Oregon (abs. ): Geol Soc. America 59th Ann. Cordilleran Sec. Mtg. Program, p. 29. Davis, G. A., 1963, Structure and mode of emplacement of Caribou Mountain pluton, Klamath Mountaina, California: Geol Soc. America Bull., v. 74, no. 3, p. 331-348. Davis, G. A., and Lipman, P. W., 1962, Revised structural sequence of pre-Cretaceous metamorphic rocks in the southern Klamath Mountains, California: Geol Soc. America Bull, v. 73, no. 12, p. 1547-1552. Diller, J. S., 1898, Description of the Roseburg quadrangle [Oregon]: U. S. Geol Survey Atlas, Roseburg folio (no. 49), 4 p.
Diller, J. S., 1903, Description of the Port Orford quadrangle [Oregon]: U. S. GeoL Survey Atlas, Port Orford folio (no. 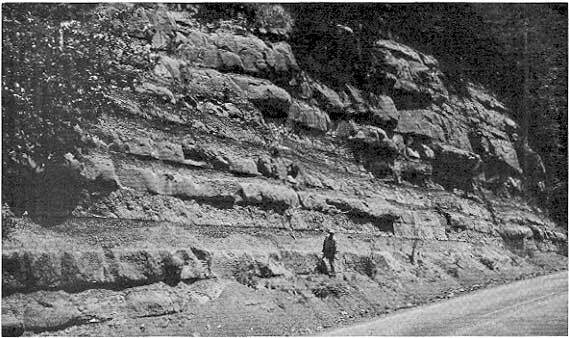 89),6 p.
Dzulynski, S., Ksiazkiewicz, M., and Kuenen, P. H., 1959, Turbidites in flysch of the Polish Carpathian Mountains: Geol Soc. America Bull., v. 70, no. 8, p. 1089-1118. Hathaway, J. C., 1956, Procedure for clay mineral analyses used in the sedimentary petrology laboratory of the U. S. Geol Survey: Clay Mineral Bull, v. 3, p. 8-13. Hoover, Linn, 1963, Geology of the Anlanf and Drain quadrangles, Douglas and Lane Counties, Oregon: U. S. Geol Survey Bull, 1122-D, 62 p.
Jones, David, 1960, Cretaceons stratigraphy of northern California and southern Oregon: Resume of talk presented before Sacramento Geological Society 4/12/60, Pacific Petroleum Geologist, v. 14, no. 5, p. 4. Krumbein, W. C., and Sloss, L. L., 1951, Stratigraphy and sedimentation: W. H. Freeman and Co., San Francisco, California, 497 p.
Kuenen, P. H., 1951, Properties of turbidity currents of high density, in Turbidity currents and the transponation of coarse sediments to deep water--a symposium: Soc. Econ. Paleontologists and Mineralogists Special Pub., no. 2, p. 14-33. Kuenen, P. H., 1953, Significant features of graded bedding: Am. Assoc. Petroleum Geologists Bull., v. 37, no. 5, p. 1044-1066. Kuenen, P. H., and Carozzi, A., 1953, Turbidity currents and sliding in geosynclinal basins of the Alps: Jour. Geology, v. 61, no. 4, p. 363-373. Laiming, B. G., 1940, Some foraminiferal correlations in the Eocene of San Joaquin Valley, California: Am. Assoc. Petroleum Geologists Bull., v. 24, no. 11, p. 1923-1939. Mallory, V. S., 1959, Lower Tertiary biostratigraphy of the California Coast Ranges: Am. Assoc. Petroleum Geologists, Tulsa, Oklahoma, 416 p.
Peck, D. L., Imlay, R. W., and Popenoe, W. P., 1956, Upper Cretaceous rocks of parts of southwestern Oregon and northern California: Am. Asscc. Petroleum Geologists Bull, v. 40, no. 8, p. 1968-1984. Sander, Bruno, 1951, Rhythmically deposited Triassic limestones and dolomites [1936 article in German translated by E. B. Knopf], in Contributions to the study of depositional fabrics: Am. Assoc. Petroleum Geologists, Tulsa, Oklahoma, 207 p.
Schenck, H. G., 1927, Marine Oligocene of Oregon: California Univ. Dept. Geol Sci. Bull, v. 16, no. 12, p. 449-460. Snavely, P. D., Jr., and Baldwin, E. M., 1948, Siletz River Volcanic Series, northwestern Oregon: Am. Assoc. Petroleum Geologists Bull, v. 32, no. 5, p. 805-812. Snavely, P. D., Jr., and Vokes, H. E., 1949, Geology of the coastal area between Cape Kiwanda and Cape Foulweather, Oregon: U. S. Geol Survey Oil and Gas Inv. Prelim. Map 97. Snavely, P. D., Jr., and Wagner, H. C., 1963, Tertiary geologic history of western Oregon and Washington: Washington Div. Mines and Geol Rept. Inv. no. 22, 25 p.
Vokes, H. E., Myers, D. A., and Hoover, Linn, 1954, Geology of the west-central border area of the Willamette Valley, Oregon: U. S. Geol Survey Oil and Gas Inv. Map OM-150. Vokes, H. E., Norbisrath, Hans, and Snavely, P. D., Jr., 1949, Geology of the Newport-Waldport area, Lincoln County, Oregon: U. S. Geol Survey Oil and Gas Inv. Prelim. Map 88. Vokes, H. E., Snavely, P. D., Jr., and Myers, D. A., 1951, Geology of the southern aud southwestern border areas of the Willamette Valley, Oregon: U. S. Geol. Survey Oil and Gas Inv. Map OM-110. Walton, E. K., 1956, Limitations of graded hedding; and alternative criteria of upward sequence in the rocks of the Southern Uplands: Edinhurgh Geol Soc. Trans., v. 16, p. 262-271. Warren, W. C., Grivetti, R. M., and Norbisrath, Hans, 1945, Geology of northwestern Oregon, west of Willamette River and north of latitude 45°15': U. S. Geol Survey Oil and Gas Inv. Prelim. Map 42. Weaver, C. E., and others, 1944, Correlation of the marine Cenozoic Formations of western North America [Chart no. 11]: Geol Soc. America Bull, v. 55, no. 5, p. 569-598. Wells, F. G., 1955, Preliminary geologic map of southwestern Oregon west of meridian 122° west and south of parallel 43° north: U. S. Geol Survey Mineral Inv. Field Studies Map MF-38. Wells, F. G., and Walker, G. W., 1953, Geology of the Galice quadrangle, Oregon: U. S. Geol Survey Geol Quad. Map GQ 25. Wells, F. G., Hotz, P. E., and Cater, F. W., Jr., 1949, Preliminary description of the geology of the Kerby quadrangle, Oregon: Oregon Dept. Geol and Min. Ind. Bull 00, 23 p.
Williams, Howel, Turner, F. J., and Gilbert, C. M., 1954, Petrography--an introduction to the study of rocks in thin sections: W. H. Freeman and Co., San Francisco, California, 406 p.
Web version Feb. 2003. Original publication date Dec. 1964.